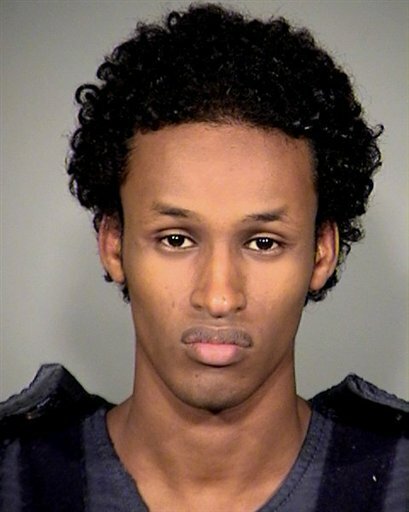 A Somali American man was sentenced to 30 years in prison Wednesday for a plot to detonate a bomb in Portland's downtown square, the AP reported. The bombing, planned by 23-year-old Mohamed Mohamud, targeted the mayor's annual Christmas tree lighting in 2010, attended by 10,000 people. The bomb was a fake, though, provided by FBI agents posing as al Qaeda recruiters. The agents made friends with him after discovering he had written for an online jihad magazine and exchanged emails with accused terrorists. Prosecutors initially sought a 40-year sentence for Mohamud, but U.S. District Court Judge Garr King said Mohamud's remorse for his actions and his youth helped lower his sentence. "The things I said and did were terrible," Mohamud said. "The hardest thing is to go over the (undercover agents') tapes, to see myself, to hear what I was saying." Mohamud chose the location and timing of the bomb, King said. When agents offered him the choice to commit peaceful acts of resistance, he instead told the undercover agents he wanted to "become operational." He was was arrested Nov. 26, 2010, after pressing a keypad button on a cellphone that he believed would trigger a massive truck bomb and kill people gathered for the annual holiday event. This entry was posted in National Security and tagged Al Qaeda, Oregon, Terrorism. Bookmark the permalink.